Alumni Nicholas wanted to give back to his secondary school by encouraging his juniors. 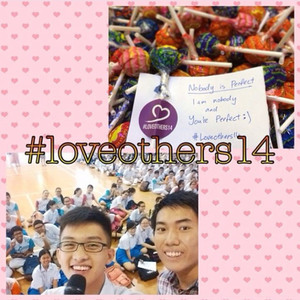 Together with Wei Ze, a friend from church who happened to be his junior, the duo started an initiative to give out lollipops with hand-written notes to encourage the whole Secondary 4 cohort. The principal invited them to speak to the entire school during assembly. While addressing the school, they shared their creative spin on the trendy phrase “You Only Live Once”— a youth lingo similar to carpe diem, or seize the day.